Blooming Comfort - Funeral wreath, round stuck, with pink roses, pink callas, lightpink/pink ranunculus, pink hortensias, evy tendrils and galax. Cherish an outstanding human being. 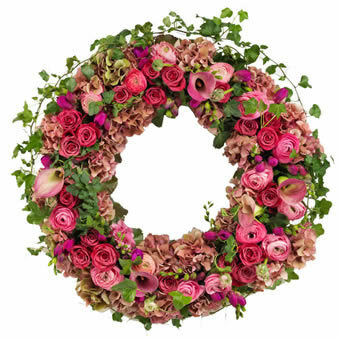 This traditional colourful funeral wreath with Zantedeschia and roses, help you honour your loved one's memory. A tasteful reminder of someone really special to you.